As the Spring Term draws to a close and we prepare to take a well-earned break from school, it's important we recap the various sporting ventures of the past weeks. A typically busy term began with a London Youth Games Rugby tournament, as Ms Burridge led a group of lower school girls to fourth place in their tournament - which consisted of twenty-eight teams from the entirety of London. This is a tremendous achievement for the girls, who had only just taken up the sport mere months ago. In particular, Ms Burridge highlighted their confidence levels, which grew with each passing game. The London Youth Games Badminton Tournament also took place this term, with Mr Westwood leading a team of year 9 girls to compete in multiple singles and doubles matches across the day. It was a fantastically organised event, and Mr Westwood insisted everyone competing was a credit to the school. The aforementioned NJIRC was undoubtedly one of the highlights of the term, providing Chingford students with the opportunity to compete on a national level. Mr Hockley led the team of keen rowers, each of whom can safely say they put in 100% effort against very tough competition. Of course, as expected, Chingford boys have once again excelled themselves in their respective football leagues. Not only do we have several cup semi finalists and finalists, but our league positions are strong enough that several year groups are still in contention for titles. Mr Gordon's Year 7s are still on for their unbeaten season, while Mr Hockley's Year 8 side are one point off of the top of the table. Mr Westwood's year 9 team are also joint top of their league, while the 10s and 11s are still in contention for the top spots. Elsewhere, our netballers have enjoyed another successful term, again impressing the PE staff with their commitment and desire to compete despite their curricular obligations. This was particularly true of the Year 11s, who have enjoyed an incredibly successful five years of netball under Ms Heaton. The lower year netballers look set to follow in this wealth of success too, with the Year 7 and 8 teams reaching the final of the Essex Plate competition. Outside of interschool competitions, the return of summer sports has excited students these past few weeks. Though there is an obvious dependency on good weather, multiple lessons towards the end of this term have consisted of sports such as Ultimate Frisbee and Rounders, two of the most popular options for students. A further new initiative to the PE Department has been the inclusion of School Experience Visitors. Though it has been a popular programme across CFS, it had never before been part of PE - but thanks to the intuition of Mr Collier, we're now able to offer the experience of a PE teacher for those that wish to pursue our career. As always, the PE Department thanks all staff and students for their collective efforts for this term, and wishes them a nice, relaxing Easter holidays. We look forward to seeing you all ready for the summer term! The penultimate week of term has proved to be a tremendously successful one, with two of our boys sides reaching the final of the Waltham Forest Cup for their respective year groups. Both the Year 9 and the Year 10 boys are successfully through and will be competing for silverware in the coming weeks. Mr Westwood's Year 9 side, after a fortuitous turn of events that saw opposition school Kelmscott drop out, will be competing for their first major honour under their new manager. Though the boys were understandably disappointed that they didn't have the opportunity to play their way into the final, Mr Westwood remained calm, assuring us that this bye would not cause complacency. 'We've been a bit lucky with the semi final but the boys have worked really hard all year to get to this point. They won't be getting complacent now - they know what they've got to do'. Elsewhere, Mr Kemal's year 10 side continued their dominant run of form with a well-earned victory in extra time against a strong Holy Family side. The boys fought back from a goal down twice, eventually taking the game to extra time courtesy of David Oppong's late equaliser. After a tightly contested extra period, the match was decided on penalties, with Chingford winning 4-3. Charlie Williams was quick to pile on the praise for their new manager, stating they're 'much more solid' under Mr Kemal's guidance. That's no surprise - it's believed he will go down as Chingford's most successful team manager in living memory, having won 15 trophies in 5 years with his famous 'class of 2016' featuring such talents as Reo Griffiths, who is now playing for Tottenham U18s at just 16 years old. The good news for Chingford's teams follows with the arrangement of two further semi-finals; Mr Gordon's year 7 side face a grudge match against Heathcote, while Mr Collier's sixth form team will travel to play Walthamstow Academy. All of the sides will take the Easter holidays to recharge and come back fighting fit, ready to compete for their medals and win CFS even more trophies. The PE department would like to congratulate all of the semi finalists thus far, and hope both they and the finalists can bring home the trophies they deserve. National Junior Indoor Rowing Championships! Last week saw Chingford enter into the National Junior Indoor Rowing Championships (NJIRC) - a prestigious event which involved the best junior rowers nationwide. Though the competition was incredibly tough, our students still managed to earn respectable scores that they can all be proud of. London Youth Rowing, the charitable organisation that hosted the annual event, created several alternative attractions to keep rowers busy while waiting for their respective races. These varied from indoor games that tested cognitive capabilities to more adventurous activities like laser tag and rock climbing. It was a well organised event, with successive races all happening promptly one after the other. CFS would also like to extend its thanks to the many volunteers and companies that leant staff to help out. After their continued hard work in fitness and rowing club throughout the academic year, CFS would also like to say a special thanks to all the students that made the effort to attend this event. Congratulations! Opinionated Article: What must Jose Mourinho do to ensure his side are in next season's title race? Our budding sports journalists were set an interesting task last week; using their own sporting knowledge and researching current affairs, they had to produce an article suggesting ways Jose Mourinho's United side can stay with the pack next season and challenge for major honours. With multiple factors to bring into consideration, it was a task that not only tested our student's knowledge of football, but their ability to form a coherent argument on the subject. Antony Bailey (7S) seems to think United's chances next season are strong, providing they make the right transfers this summer. Here's what he has written. I think that in order for Jose Mourinho to win the title race next season he must keep his formation of 4-3-3. To have an effective squad Mourinho should sign forward Antoine Griezmann from Atletico Madrid (although his price is rumoured to be around £100m!). He could also sign centre forward Pierre-emerick Aubameyang from Borussia Dortmund as well as Monaco full-back Fabinho. Another great signing would be centre-back Diego Godin from Atletico Madrid and Real Madrid attacking midfielder Isco. In order for Mourinho to boost his transfer kitty, there are players who could be givent eh axe such as Marouane Fellaini, Marcos Rojo, Bastian Schweinsteiger and Phil Jones - none of whom currently see much first team action. Manchester United would be unstoppable with Zlatan Ibrahimovic, Paul Pogba and Antoine Griezmann up front. This is why in my opinion 4-3-3 would be such an effective formation! However, Mourinho has a decent core squad in David De Gea, Eric Bailly, Luke Shaw, Michael Carrick, Henrikh Mkhitaryan and Anthony Martial - all of whom should continue to be given regular first team appearances. Overall, I think that Mourinho should keep his formation 4-3-3, sign Griezmann, Aubameyang, Fabinho, Godin and Isco. He should also give some players the axe and play Pogba, Ibrahimovic and Griezmann up front. With this strategy Mourinho will increase his odds of winning the title! Antony's article shows fantastic knowledge of football as well as a strong opinion on what United need to do to succeed. Because of these efforts, Antony will be rewarded with the opportunity to analyse the performances of one of Chingford's own football teams - a first in school history in terms of sports journalism. Well done Antony! February marked the return of the school football calendar, bringing with it a great level of anticipation from the Chingford boys. Though adverse weather played devil's advocate to our planning, we were still able to compete across a multitude of fixtures, producing some truly stunning results. The worsening weather, personified only as Storm Doris, wrecked havoc on our Year 8's performance last week. They put in a valiant effort but were narrowly defeated 1-0 by Walthamstow Academy, a result reflecting the difficult conditions as much as anything. This weather also ruled out a Year 10 fixture, with conditions deemed unplayable against Highams Park. Though we were unfortunate in our Year 8 result, the Year 7 boys put in a performance to be proud of, thrashing Rushcroft 18-0 amidst murky conditions. Team manager Mr. Gordon was quick to praise his boys, though he did later refer to himself as 'God's gift to football management'. It was a result befitting of the Year 7's superiority throughout the campaign thus far, with a solitary defeat in the Essex Cup semi finals the only blot on their copybook. Year 9 boys were also in inspired form this week, recording a 6-0 victory away at Heathcote in an all-or-nothing match that decided both league points and cup progression. Their team manager Mr. Westwood was delighted to get the win in a game that had to be rearranged several times. "Despite our injuries and some less than ideal playing conditions, the boys were able to pull off a brilliant result. It was great to keep a clean sheet too!" Mr Westwood was also quick to praise one of his star players: "Ange Mulula (9C) in particular controlled and dominated the back line with confidence and professionalism. He was my man of the match." With many more fixtures to come, Chingford will be hoping to continue their good run of form well into the summer. The commitment shown by the boys to turn up and give 100% despite less than ideal conditions is commendable, and though they did not all get the results they deserved they can be very proud of their efforts. Chingford PE Department are certainly hoping that the boys can continue to impress us throughout the season! Witnessing an Olympic event is a once in a life time experience for most people. I was lucky enough to have the chance to see the women's 3m springboard diving semi-finals at the London Summer Olympics on 4th of August 2012. This day was to be remembered as 'Super Saturday' - the day when the British team won most medals. The event spanned from the 29th of July to the 11th of August at the Aquatic Centre within the Olympic Park and featured 136 athletes representing 25 countries. Diving was one of the four aquatic sports at the Games (along with swimming, synchronised swimming and polo) and hosted competitions in eight events (men and women events of): 3m springboard, synchronised 3m springboard, 10m platform, and synchronised 10m platform. As far as the qualifiers were concerned, a nation could have no more than 16 divers qualify (up to eight males and eight females) and could enter up to two divers in individual events and one pair in synchronised events. On the day, I vividly remember the excitement that gripped the crowd every time an athlete was drawing in breath, preparing to take the plunge. One after the other, 18 divers performed, with only the best 12 advancing to the finals. A flip, twist and a splash - each dive seemed to be over in the blink of an eye. Not surprisingly, the first two places were claimed by the Chinese (at this event they won 10 medals - 6 of them gold), followed by the representatives of Mexico and Italy. I cannot say that I became a diving fan (the scoring is too technical for my liking), but that day it felt wonderful to be part of such a special sporting event, a memory that I will treasure forever! This post was written by Antony Bailey of 7S as part of the Sports Journalists Club! If you would like to get your work published, simply visit the PE Office and enquire within! 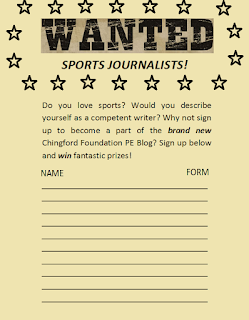 Introducing Chingford PE Blog's Newest Initiative - The Sports Journalists Club! 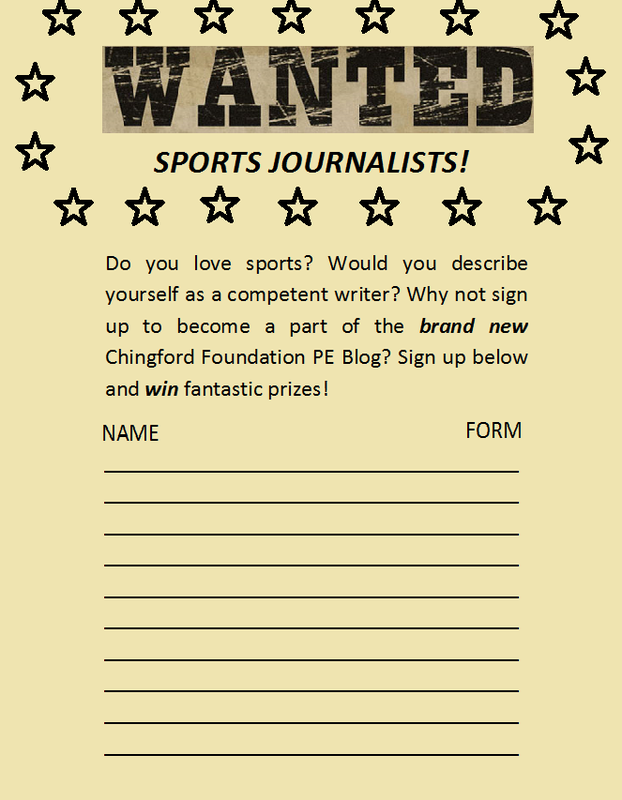 ﻿﻿﻿﻿It was mentioned in an earlier post that the Chingford PE Blog would be open to any student wishing to showcase their flair for writing and passion for sports - this led to the creation of the Sports Journalists Club (SJC). Hype began to build around this opportunity, with students across all year groups encouraged to sign up via a stylistically designed 'Wanted' letter. Although it didn't quite have the buzz around it that a Triwizard Tournament would possess, students were still eager to show their interest, with over 40 names signing up. Thank you to everyone who took the time to put their names down! The sign-up sheet, offering pupils a chance to join our ranks! The first meeting featured a decent number of students, each one eager to see what the SJC had in store for them. The first task would be centred around creative writing, requiring the students to describe a sporting event they either witnessed or took part in themselves. It was a task to gage the level of interest in writing for the blog, as well as suitability in terms of the individual's writing ability. The potential for the SJC is enormous, although it will depend on the levels of commitment shown by Chingford students. As long as students are willing to learn, there will be opportunities to visit school games and report as a real journalist would do. Being able to imitate journalistic style is a skill you would usually expect from an A Level student, but with talent as young as Year 7 available at the blog's dispense, we can expect to see many articles appearing in the near future. Chingford PE Department would also like to offer congratulations to all new members of the SJC, and we look forward to hearing from each and every one of you as the year develops.